The combined chimney-piece and overmantel as a decorative unit was a feature of 16th-century interiors. During the 17th century such features were designed by architects. By the mid-18th century they had become a vehicle for elaborate assymetrical carving, often designed by the craftsmen who made them. 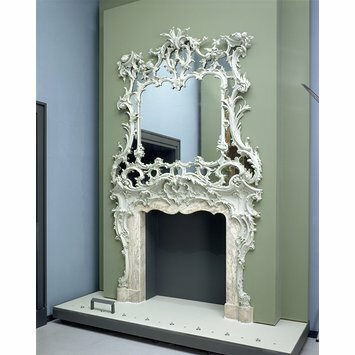 This chimney-piece was commissioned by the Reverend Gideon Murray for the drawing room of Winchester House, Putney. Murray acquired the house through his marriage into the Huguenot Montelieu family. His wife's great uncle, James Baudouin, a Huguenot refugee from Nîmes, France, settled in Putney in 1729, when he built or rebuilt Winchester House. It was bought by the Museum from Walter Rye, a former resident of Winchester House. 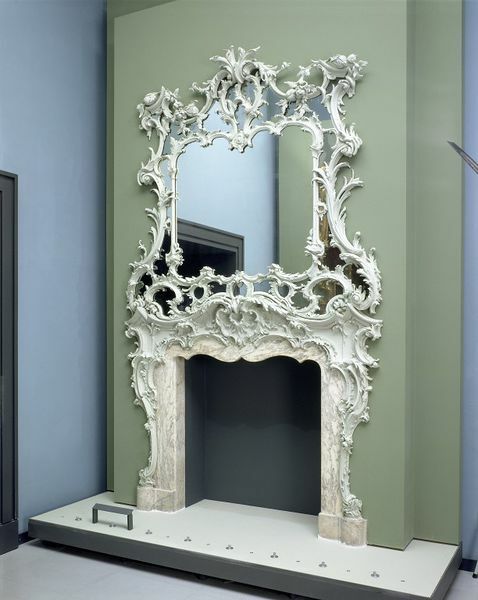 The merging of the carved wooden overmantel with the marble fire surround is typical of Rococo interior decoration. Some carvers worked both in wood and marble, and it is probable that all the elements of this chimney-piece were designed and made in the same workshop. Commissioned by the Reverend Gideon Murray for Winchester House, Putney, London.